I just had to include this photo of a Championship plaque because my teeth almost fell out when I saw it! Are they kidding??? Who thought this was a good design, especially for young guys? And I’d love to know after which unfortunate fellow they designed it! Just sayin’, if you get my drift. Photo by Karen Salkin. I don’t think even Charles Barkley watches as much of the NCAA Basketball Tournament as I do! So I needed a day, after the Final Four teams were decided, to sort-out my feelings. And to give my poor eyes, and back, (from being a couch potato for twelve hours in a row,) a rest! And for the next two days, two week-ends ago, I recorded it all, and watched each game by its self. It took me until the tournament resumed this past Thursday to finish it all, but mission accomplished! I went out this past Thursday day and night, and Friday night, but I still recorded, then watched everything; I finished just in time for the Elite Eight to start on Saturday at 2PM! I’ve barely slept. No lie. 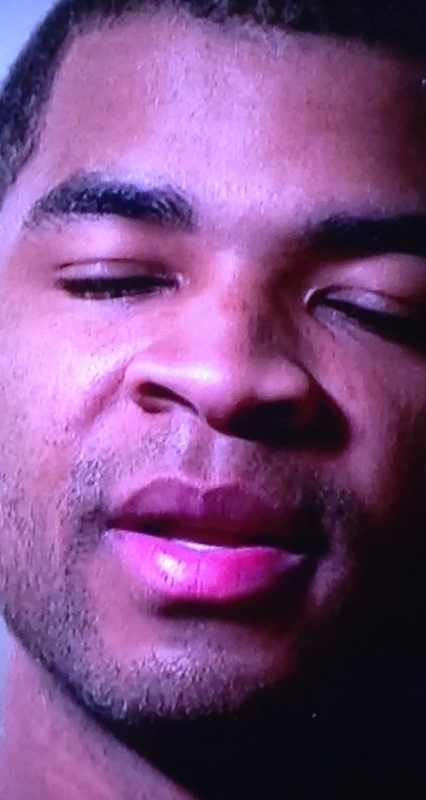 One of Kentucky’s Harrison twins, who not only has nothing to say, but it looks like he’s wearing lipstick! Photo by Karen Salkin. And now, after all that, I have no more dogs in the race. But I’m going for Duke over Michigan State, and Wisconsin over the big men of Kentucky. That’s a hard one for me, because I believe in fairness so much, (and Kentucky is undefeated this year, so I guess they deserve to win it all, bite my tongue,) but I just don’t like the Kentucky personnel, and the Wisconsin Badgers have really grown on me, especially Sam Dekker. I love that he often smiles during the game, which very few other college players do. An emotional Ron Hunter, embracing his son, after what is most likely RJ’s last college game. The undisputed winner of the entire tournament for me is Georgia State Head Coach, Ron Hunter. His one win really put him on the map. I’m sure all sports fans know the story by now, but for the rest of you, here’s the quick run-down: He tore his achilles tendon celebrating a win at the end of the regular season, which is weird enough. We started hearing rumblings about him then. So, during this post-season, he had to coach from a stool. His son, RJ, (a great kid,) is the star of the team, and made an amazing game-winning shot in their first-round game. And, when he saw that shot go in, Ron fell off his stool!!! I noticed it the second it happened, before the announcers and Mr. X, and I got hysterical. I watched it about twenty times (no exaggeration) right then, and laughed like a lunatic every time. And I’m not a fan of physical comedy! But this is a riot. After the game, he kept patting his son and declaring, “I love this guy!” It sounded so funny to say about your own progeny! His post-game press conferences were great, too. He’s very entertaining. He said that he told his wife that if he had known how good a player RJ would be, they would have had more kids. So, TBS brought him into the studio for two days the following week to be on the panel of analysts. And I guarantee you, when his coaching days are over, he’ll have a successful sportscasting career. He’s almost as funny as Charles Barkley. In a different way. If RJ enters the draft this June, you’ve got to look for Ron on the telecast. I predict a bunch more tears and raw emotion from him. 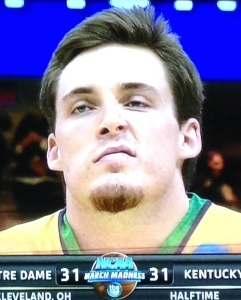 Pat Connaughton, looking like the tough guy that he is. (But he doesn’t ever appear to be punky, like this facial expressing is indicating.) Photo by Karen Salkin. Louisville Coach Rick Pitino gave the most honest, real-talk half-time interviews. They were always like he was just having a conversation with someone, not an interviewer at half-time. Props to him for that. For example, of the Michigan State Spartans, whom his Louisville Cardinals were leading at the half (but eventually lost to, making me sick,) he said (with a little laugh at the end,) “We got them to take a couple of shots that I would pull my guys out for two weeks if they took.” Slam. The producers of these shows always get me with the human interest stories. I have to keep a box of tissues at the ready. Sometimes even the analysts have to wipe tears away! I can’t believe some of these guys are college students. They’re so stupid! Kentucky’s Andrew Harrison was an idiot in his studio interview on Sunday. He had no answers, and ended an attempt at one with, “So, not too much difference, but, you know.” OMG!!! That particular interview, with Harrison, fellow team member Willie Cauley-Stein, and coach Tom Izzo, was the anti-Ron and RJ Hunter one! I don’t think any of that trio will have careers in sportscasting. 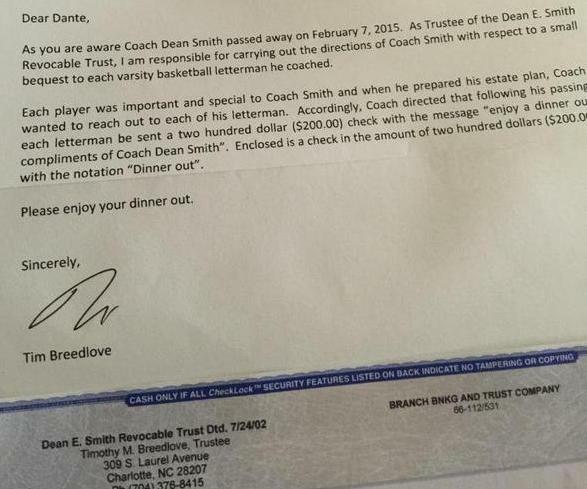 The letter, and check, that went out from Dean Smith’s estate attorneys to his former players. 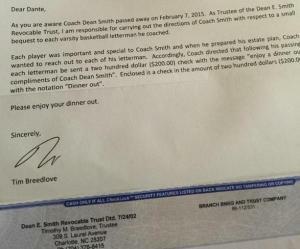 I loved something the late great UNC coach, Dean Smith, did, and I’m so glad the powers-that-be brought it to our attention. When he passed away recently, he left $200. to each of his former varsity lettermen players, (which is a lot of guys, since he coached there for thirty-six seasons!! !,) to “Enjoy a dinner out.” OMG! I love that so much!!! I’m kind-of surprised that all the sportscaster made no, or just one, mention of the passing of two famous former players and analysts/announcers. Hot Rod Hundley was lauded by only fellow announcer Jim Nantz, and absolutely no one said anything about the passing of the pretty young Jack Haley, who died two weeks ago at just fifty-one! Maybe they did it in one of the very few minutes of coverage I missed, but I doubt it, because I at least look through the minutes I don’t have time to watch intently, and never saw their pictures. Very strange. And totally disappointing. Gonzaga’s Adam Morrison, now and then. There was something that kind-of shocked me on Sunday night, outside of Notre Dame losing when they had been so obviously winning all game. There was a really nice-looking guy, in a good suit and tie outfit, with a slicked-back ponytail, sitting behind the Gonzaga bench. 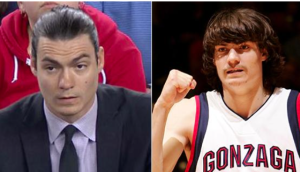 I couldn’t believe who it turned out to be–Adam Morrison!!! Remember him? He was the creepy-looking guy who was sitting on the court, crying, when they lost to UCLA in the 2006 Sweet 16. Back then, he had an unappealing mop-top of hair, and the most caterpillar-esque moustache ever. And now, here he was, looking so attractive, I could not believe my eyes! After a less-than-stellar pro career, (I think that was because he tore his ACL,) he’s back with Gonzaga, as a video assistant. So, good for him! As usual, I love Charles Barkley! I try to always watch the halftime segments he’s on, just in case he says something that makes me laugh, which is just about all the time. Even Kenny Smith got off a few good ones in these past few weeks, all because of Chuck. The CBS analysts, looking very coordinated, which I love. (L to R) Greg Gumbel, Clark Kellogg, Kenny Smith, Charles Barkley.) Photo by Karen Salkin. But there’s a new panelist to laud this year. He’s not a new guy, but he has a new approach. It’s Clark Kellogg, who used to just repeat what everyone else said. But this year, he’s the new me! He listens to the others, then politely calls them on their nonsense. If the guys are just saying whatever they want to because they have idea how to answer a question, Clark stays on them, making them come up with something legitimate. And he’s always trying to get Kenny and Charles to stop picking on each other. I’m really a fan of this guy now. I wish he could be on the TBS NBA panel with those dudes, instead of waste-of-time, always-thinking-he’s-funny, mumbling-along Shaq! That’s it for now. I’ll take notes on the three games next week-end, and give my final thoughts after it’s all decided. I’m having a big problem with for whom to root now, because, being undefeated all season, Kentucky deserves the Championship, but I don’t like them. And I love Coach K of Duke, but don’t want them to win, either. And I really dislike the Spartans. So, I guess I’m hearing myself choose Wisconsin. Thanks for letting me talk that one out! So, go Badgers!!! If only to see Frank Kaminsky dance!